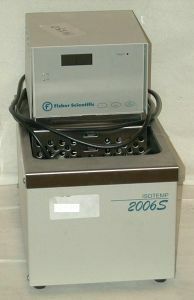 Product Description This Fisher Scientific Isotemp 2006S bath has a 6L capacity and a temperature range from above ambient to 150C. The pump is 15L/min and it has a low reservoir/overtemp visual alarm. Temperature stability is +/-0.05C. NOT recommended for use in sous vide cooking: although we sanitize as part of our overhaul, we cannot guarantee sterility suitable for human consumption.